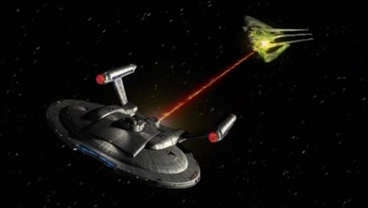 As originally designed, the NX Class featured plasma cannons, phase cannons, and spatial torpedoes. 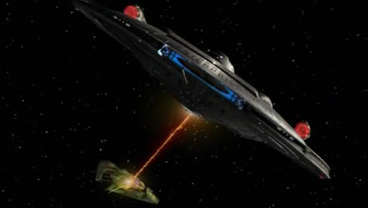 NX-01, SS Enterprise, launched prior to the installation of her phase cannons, forcing the temporary use of the plasma cannons. They have, rather unfortunately, not been seen again. 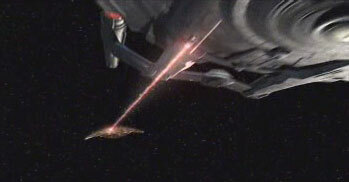 It is made clear in "Silent Enemy"[ENT1] that the ship is only supposed to feature three phase cannons. They are all placed on the ventral side (i.e. bottom) of the ship. 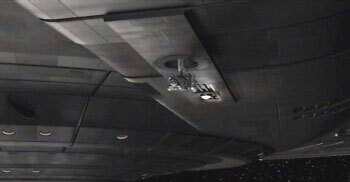 The two forward cannons drop from ports on the exterior of the ship near the spatial torpedo launch apertures. There is also an aft cannon, rather quirkily placed on the starboard rear of the saucer on one of the "catamaran" sections. Close examination of CGI five-views from the Star Trek Magazine indicates that, contrary to my prior assessment, these locations are not random. The model has a number of round ports which are similar to the ones from which the original phase cannons emerged. 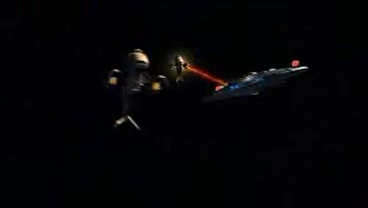 "Civilization"[ENT1] shows the ship's sensors being used from orbit to zoom in closely on a talking pair of aliens on the planet below. The orbit is stated to be 500 kilometers. 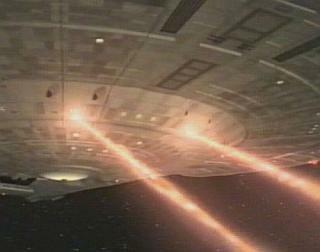 In "Silent Enemy"[ENT1], the alien vessel's shields fall for two seconds while they fire on Enterprise the first time. T'Pol is able to take scans, and notes that the alien DNA matches nothing in the ship's database. This means that in the space of two seconds, the sensors were able to scan at least some of the most basic parameters of the alien DNA, if not a significant portion of the alien genome. This was done at a range of just a few kilometers, but still represents an impressive scanning ability. In "The Xindi"[ENT3], Enterprise sits in orbit of a mining world. While there, she detects and scans three vessels inbound at warp, with an ETA of two hours. Their hull composition and weapons complement is also scanned. That implies that, at a minimum, the ship has a sensor range of two light-hours, with sufficient resolution to determine materials and scan for weapons at that distance. (If the warships were travelling faster than lightspeed, the true range would of course be greater.) Two light-hours represents a distance of 2.16 billion kilometers, which is about 600 million kilometers more than Saturn's average distance from the sun. Foreman: "What insulation does your ship use, Captain?" Archer: "Our outer hull is lined with duranium." 1. We all heard the two statements in "Broken Bow"[ENT1]. The first was that warp 4.5 meant that the ship could get to "Neptune and back in six minutes". Mid-April 2151 will feature Neptune as being some 29.985 astronomical units from Earth, or about 4,485,756,000 kilometers. So, the ship would be travelling at about 747,626,000 kilometers per minute, or over 12,460,400 kilometers per second. In lightspeed terms, that is only 41.5c. Later, during the flight to Q'onos, Archer comments that warp 4.4 = 30 million kilometers per second. That's almost exactly 100c. Instead of suggesting that 4.4 is faster than 4.5, it presumably implies that there's some turnaround time involved at Neptune in the 4.5 example given earlier. In any case, many have pointed out the inconsistency of the Klingon homeworld being only four days away in "Broken Bow". It is canonically inconsistent anyway, but even worse when you consider that at 100c that would make the homeworld about a light-year distant at the velocities given in the episode. 2. We're given a date for "Civilization"[ENT1] and, of course, for "Broken Bow"[ENT1]. During the tracking of the Suliban in the latter, Archer gives the date of April 16, 2151, and at the end of the former episode Archer gives a date of July 31, 2151. That's 106 days. The importance of these dates seems limited, until you consider that "Civilization" also gives us a firm distance from Earth: 78 light-years. Distance divided by time equals speed. Thus, ignoring for the moment all the other events and detours of the series up to that point, that implies a speed of no less than 0.736 light-years per day, or about 268.5c. That's significantly faster than the 100c from "Broken Bow", and requires that the ship be faster than even 268.5c. Why? 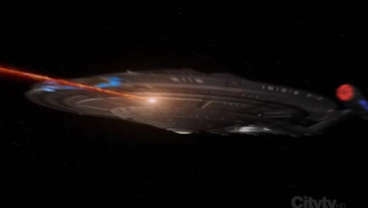 Because just four episodes earlier, in "Terra Nova"[ENT1], the ship had been within 20 light-years of Earth, meaning they travelled at least 58 light-years between "Terra Nova" and "Civilization". While we don't have a date for "Terra Nova", we can estimate based on the episodes before and after. In the prior episode, T'Pol says it has been less than a month since the ship was at Q'onos . . . in the latter, we learn that T'Pol has been aboard Enterprise for 67 days. Based on a mid-April launch date, "Terra Nova" therefore had to have occurred sometime between mid-May and mid-June. Assuming the ides of both months, that's means that Enterprise travelled at least 58 light-years in some time between 46 and 77 days. Her average speed would thus have to have been between 275 and 460c. 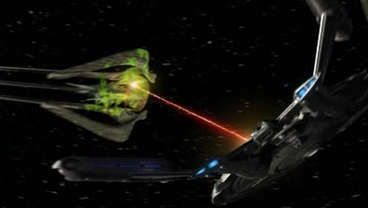 And, of course, Enterprise's course almost certainly was not a straight shot toward the Akaali world of "Civilization". 3. In "Cease Fire"[ENT2], the Enterprise demonstrated the ability to achieve a speed of 1460c. With her injectors running at 110% (though, as stated, they are rated to withstand 120%), she was able to reach Weytahn, "a dozen light-years" from her original position, in three days. 4. In "Horizon"[ENT2], Enterprise is ordered to travel "almost 30 light-years" to observe a planet whose unstable orbit is carrying it between two gas giants. Starfleet believed that the planet would be covered in erupting volcanoes "by the end of the week". 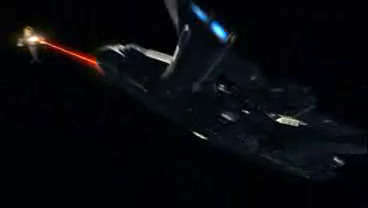 Enterprise sets a course, then makes a detour stated to last ten hours to drop off Travis Mayweather at the ECS Horizon. Assuming that the mission started the very first moment of the week, Enterprise would've had exactly seven days to arrive for the volcanic eruptions, or 168 hours. Between the ten hour detour and the thirty-hours-early arrival, the ship must've made the trip in 128 hours. If "almost 30 light-years" equalled 25 light years, then the ship's speed would've been 25 light years per 128 hours, or 0.1953125 ly/hr. That is 1,710c. 5. "The Xindi"[ENT3] features Enterprise in the region known as the Delphic Expanse, which in the prior season's finale of the same name was described as a 2000 light-year wide area of spatial distortions, seen to be surrounded by a glowing purple cloud. In "The Xindi", the Xindi Council discusses the appearance of Enterprise within the Expanse, and the comment is made that Earth is 50 light-years away from their location. Assuming the Council is in the Delphic Expanse, this would mean that the Expanse itself is only 50 light-years distant. It is apparently somewhere past Vulcan: Enterprise was at first en route there on her three month trip to the Expanse and, after T'Pol's change of heart two days prior to arrival at Vulcan, then spent seven weeks getting to the Expanse, at a stated speed of warp five. Even assuming that the Xindi Council was at the edge of the Expanse closest to Earth, that would imply that Enterprise took about three months to travel 50 light-years at her stated maximum speed of warp five. Even at the lower limit time value of seven weeks (49 days), that implies a speed of only 372c for warp five. For three months (90 days), the value would be 202c. In short, the idea that the Delphic Expanse is only 50 light-years distant is inconsistent. Either the Council was meeting somewhere close to Earth for some reason, or else that statement was based on light-years which are much larger than Earth-based standard light-years. 6. The Triannon homeworld of "Chosen Realm"[ENT3] was 6.3 light-years distant from the site where the Triannons boarded Enterprise. The journey to the homeworld was three days, though no speed is given. That is 2.1 light-years per day, or 766.5c. Conclusion: Enterprise's top speed is at least 1,500c.